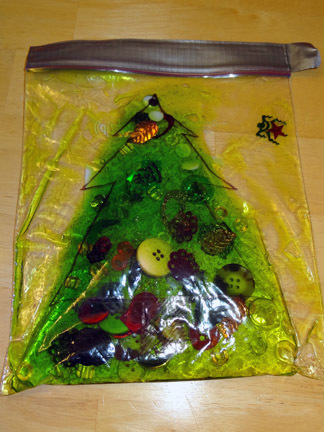 If you are looking for Christmas activities for kids, check out these Christmas tree sensory bags we recently created! 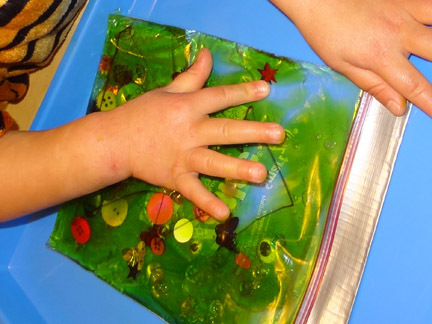 Sensory bags, also sometimes referred to as squish bags, provide kids with a fun sensory experience with virtually no mess. 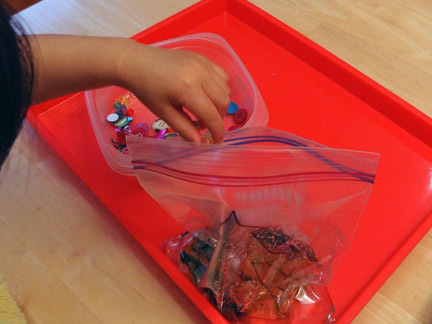 Sensory bags may also be more easily tolerated by kids with sensory processing issues who dislike sticky or messy hands. 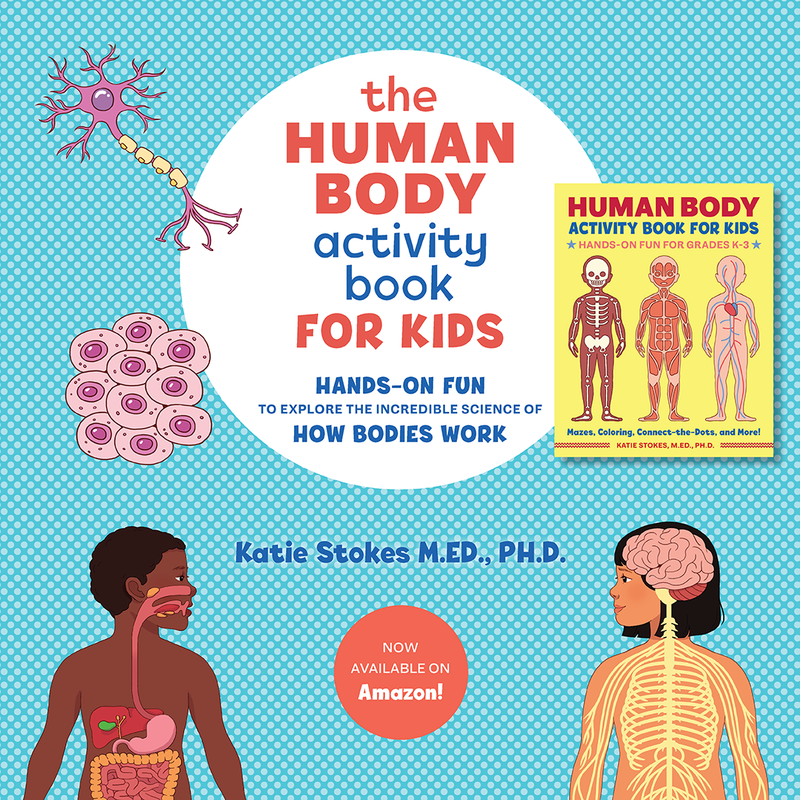 My kids were hooked on this activity as soon as I told them we were making Christmas trees. 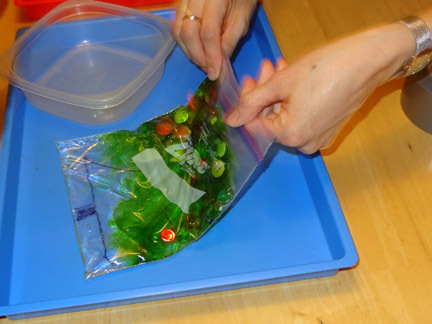 And they really enjoyed the sensory play experience of putting the materials in their bags and squishing them around. 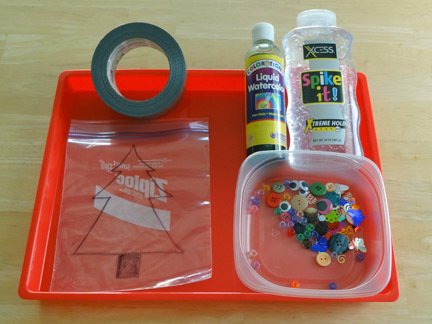 Read on to learn how we created and used our Christmas tree sensory bags! 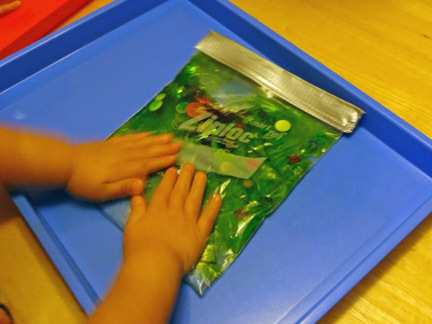 The kids loved squeezing the gel into the bags. I just had to make sure they didn’t squeeze too much. 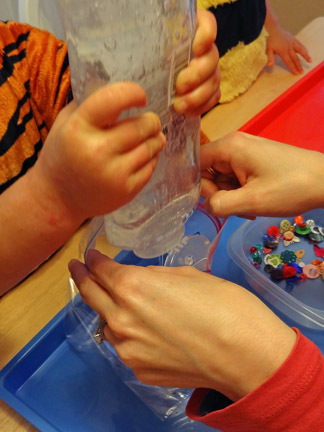 We found the right amount to be less than 1/4 of the bottle of gel. 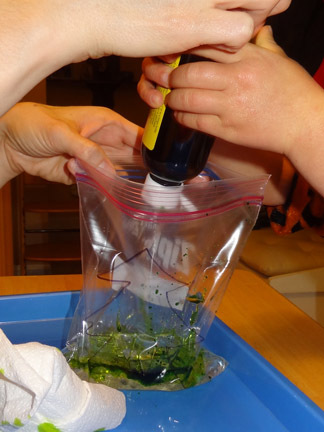 Then the kids put green coloring into their bags. 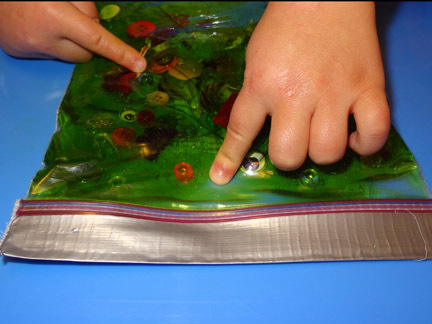 The kids squished the materials together, mixing the green coloring with the clear gel. They enjoyed the squishy sensation of the bags. 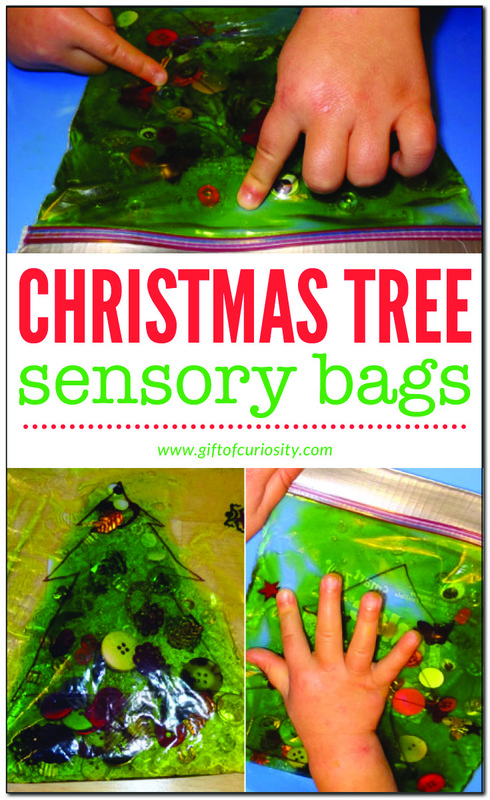 The kids found lots of ways to play with their Christmas tree sensory bags. They put them on their heads and called them “hats.” They pretended to “steal” each other’s bags and laughed and laughed when they would get “caught.” They held them in front of their faces to look through them. she is wearing her bumble bee Halloween costume in this picture. 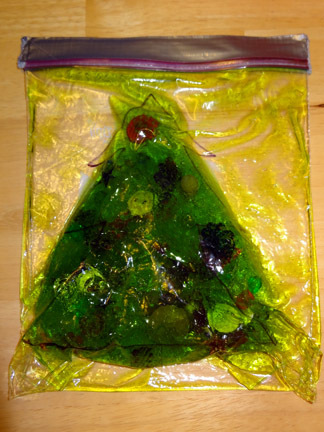 The one thing the kids did NOT want to do was to turn them in to Christmas trees they could decorate. And that was, of course, supposed to be the whole point of the activity. So Grandmum and I had to, ahem, “borrow” the bags for a few minutes to make Christmas trees. I put a red button at the top of QBoy’s tree and Grandmum put a googly eye at the top of XGirl’s tree. In hindsight, I would have provided the kids with fewer “ornaments” to put in the bags. I had set out a lot of items, thinking the kids would choose their favorites. 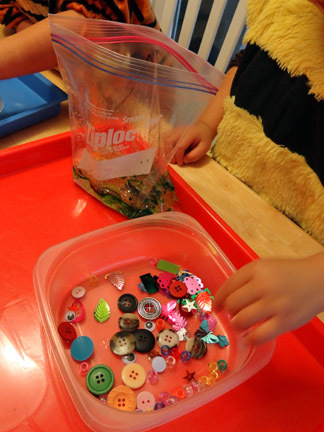 But of course, they didn’t pick and choose but instead simply added everything to their bags. This made it challenging to “decorate” the trees. 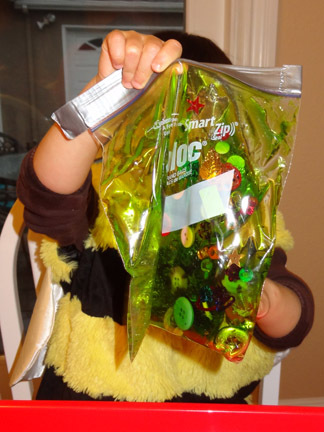 Of course, the kids didn’t seem to care and still thought the Christmas tree sensory bags were a ton of fun. 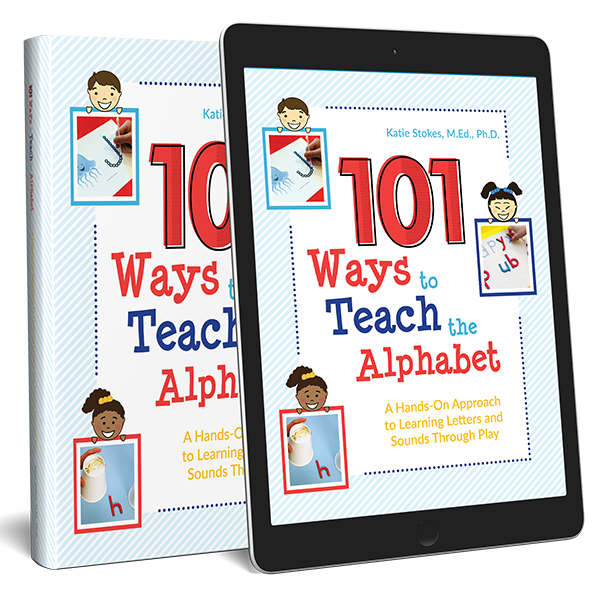 This is a super cute idea! I think it would be hours of fun. I just pinned it. 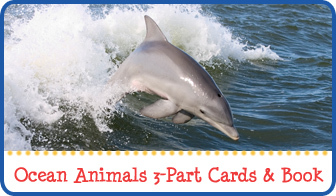 What a cute and fun idea! 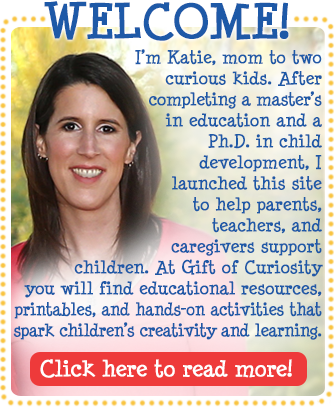 Thank you for sharing at Sharing Saturday!! 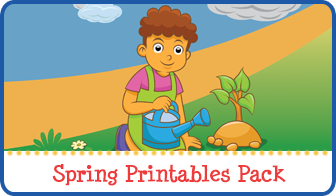 Could you use something else to make it green like food coloring or paint? This is adorable! I think food coloring would work really well. Some types of paint might work fine too.